Resistance, in this environment, is at least as much about crafting alternative stories of community and humanity. Illustration by Ernesto Yerena Montejano. It’s April 10, a sunny early-spring day in downtown Sacramento, and several dozen people have gathered for a rally on the west side of the tall stone-and-glass Robert T. Matsui United States Courthouse building. Many in the crowd, members of unions like SEIU United Service Workers West as well as of immigrant-rights organizations and various community groups, are holding posters and wearing T-shirts adorned with the words Caravana Contra el Miedo (“Caravan Against Fear”). Under the words is a picture of a resolute young girl, arms outstretched, with an eagle soaring skyward in the background. At the edge of the group, several protesters are holding up a four-foot-tall wire-mesh fence, along with signs vowing No Mas Familias Separadas. Towering above them is a tall wooden cross, around the trunk of which is coiled ugly, lethal-looking barbed wire. They’ve come to a friendly place: Ever since Donald Trump’s election, California’s politicians have been busily passing sanctuary legislation intended to limit the ability of companies in the state to cooperate with the building of a border wall, as well as bills limiting local law—enforcement cooperation with agents from Immigration and Customs Enforcement, all intended to create momentum against Trump’s proposed $20–$25 billion boondoggle. Of course, since there are already hundreds of miles of walls and fencing along the US-Mexico border—-and since Trump’s expansion, in the unlikely event that it’s ultimately funded by Congress, wouldn’t be built for years—his architectural folly will have far less day-to-day impact on immigrant communities than his massive expansion of ICE raids. So the real goal of California’s politicians, and the activists here on this spring day, is at least partly symbolic: to develop a counternarrative to the Trumpists’ fear-driven story of “invasion,” “crime,” and “border anarchy.” After all, so much of Trump’s agenda is about symbols rather than concrete actions and substance, about story lines that create poisonous divisions between “us” and “them,” and about dehumanizing entire sectors of the American population. In New Mexico, where some public-school districts have seen massive declines in attendance as ICE raids intensify and scared parents withdraw their children from the classroom, State Representative Angelica Rubio pushed HB 116, a bill similar to California’s SB 54; it died in committee. So did another of Rubio’s bills, this one aimed at preventing the use of public lands in building the wall. “We are faced with a lot of fear, confusion, and racial bias along the border,” Rubio argues. “There was already a fear of the police. Now it’s exacerbated.” In Arizona, Representative Isela Blanc—one of two formerly undocumented immigrants elected to the State Legislature this past November, in a harbinger of how Arizona’s political complexion may be shifting as its demographics change—has been pushing her own set of pro-immigrant and anti-wall legislation. It, too, hasn’t gone anywhere—perhaps not a surprise in a state where conservatives still dominate (albeit with shrinking majorities in recent election cycles), and where SB 1070 has long been the gold standard for pushing restrictive state-level policies aimed at undocumented immigrants (that bill, among other noxious provisions, empowers law-enforcement officers to ask the immigration status of anyone they stop or pull over). In Texas, where the Border Patrol already runs gunboats up and down the Rio Grande, legislators recently passed extraordinarily coercive legislation aimed at corralling any would-be sanctuary cities. Yet California is different. Polling data from the Public Policy Institute of California (PPIC) suggest that more than 70 percent of the state’s residents oppose the wall. And the scale of this opposition, as well as the fact that Democrats have a supermajority in the Legislature, has given lawmakers strong cover to pursue a raft of bills intended to stymie efforts to build it. In addition to the divestment bill, other legislation in the pipeline would prohibit California’s government, as of January 1, 2018, from contracting with companies involved in the wall’s construction. It is likely that California officials will use the stringent requirements of the California Environmental Quality Act to tie up any border construction project for years while environmental-impact reviews are carried out. 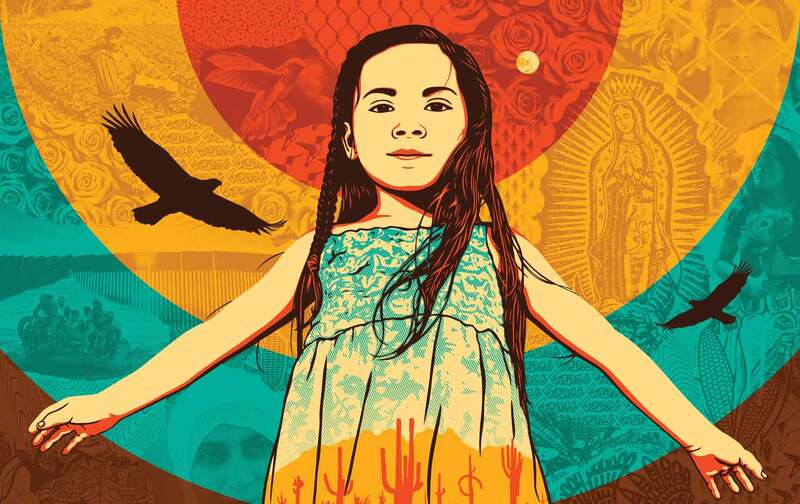 April 10 is the first day of the three-week-long Caravan Against Fear, a 2,000-mile trek that will head down California’s Central Valley to Los Angeles, then south to San Diego, east into Arizona, and along the Mexican border in Arizona, New Mexico, and Texas. Those who stay with the caravan the whole three weeks will end up at a series of rallies in Texas at month’s end. Then they’ll drive back to California in time for the huge May Day protests that have, in recent years, become a tradition in Los Angeles and other cities on the West Coast with a heavy immigrant population. “I want to help undocumented people,” explains Doña Petra Ramires, speaking in Spanish. Originally from the Mexican city of Guadalajara, Ramires is 79 years old, all of four feet, six inches tall, and with a tanned face as wrinkled as the Southwest’s desert canyons. In her long white dress and white lace head scarf, she looks like a character from colonial Mexico or Goya’s Spain. At every stop, the caravan will host rallies, meet with local activist groups, and lobby politicians to oppose Trump’s wall. They will sleep in union halls and on the floors of churches. They will go through inland border checks, where Homeland Security agents will demand their papers. They will hold protests at already fortified stretches of the desert border, picket outside the offices of conservative politicians who support the wall, and meet with Native American communities, including the Tohono O’odham Nation, which is based in the wild, mountainous desert southwest of Tucson, and on whose land the Border Patrol has long played cat and mouse with would-be migrants. Shortly after noon, the caravan sets off, heading south on Highway 99. Along the side of the road, after a rainy winter, the yellow wildflowers are in a rare “superbloom.” Heading toward the little Central Valley farming town of Modesto, the caravaners drive slowly this first day, stopping frequently. The drivers are still getting to know their unwieldy vehicles; some, like Daniel Robelo, a young activist with the group Global Exchange, admit to being more comfortable riding a bicycle than driving a 15-seat van. Nine days later, the vans arrive at Pastor Rolly Loomis’s First United Methodist Church in Tucson, a Spanish-style building dating to the 1930s, with a peaceful courtyard and a bubbling fountain. In recent years, the church had partnered with ICE to house dozens of asylum seekers—mostly single parents from Central America and their children—while their cases were being heard. Recently, however, the Trump administration seemed to put the kibosh on that program; the numbers slowed to a trickle. And so when Loomis, a kindly-looking man with receding hair and a graying goatee, heard that some four dozen caravaners would be rolling into town and needed a place to sleep, he offered up the metal-frame cots in his church basement. All around the country, faith communities and other groups have picked up on this moral imperative. In Berkeley, Oakland, and several other cities, local activists like the Partnership for Working Families are pushing for divestment ordinances similar to the measures being proposed in California. Groups like the Central Coast Alliance United for a Sustainable Economy have begun working on text-message alert systems in Ventura, Santa Barbara, Los Angeles, and several Bay Area counties so that members can quickly be notified and called to protest in the event of local ICE raids. They have also been holding workshops in immigrant neighborhoods to explain the language that residents can use in refusing to open their doors to ICE agents who come snooping without a search warrant. In the courtyard of First United Methodist the morning after the convoy arrives, Alejandra Valles, a caravaner originally from El Paso, Texas (the town her undocumented parents ended up in after crossing the border), who now lives and works in Los Angeles, is enjoying the desert sun. She had been driving the lead van for the past several days, as well as coordinating many of the protests and meetings. Now, sitting on a bench in skinny black pants, a sleeveless blouse, and stylish patterned sandals, she’s taking advantage of some quiet time to recharge before the group heads over to the office of the local Republican representative, Martha McSally. The plan is to protest in the foyer and, with the diminutive Doña Petra Ramires in her trademark lace head scarf and dress at the front of the crowd, mount a moving picket on the street outside. Six months into trump’s administration, despite his executive orders regarding the wall, he’s made no real progress. Congress hasn’t appropriated money for it, nor has the administration worked out a way to make Mexico pay for it. No construction has begun, and none of the border-state congressional delegations are in favor of the wall. Moreover, the exacting requirements of the California Environmental Quality Act mean that, at least along the Golden State’s stretch of the border, the project is likely to face years of litigation before it can get off the ground. So Trump’s “big and beautiful wall” is still what it was during the election campaign itself: an ugly rhetorical symbol representing a promise to “get tough” on “illegals”—a demagogic way not to solve complex transnational social and economic problems, but to unify Trump’s ethno—nationalist base around hatred of a vulnerable population. Yet two can play the symbol game. As 2017 unfolds, the wall has increasingly been used by community organizers, activists, and legislators to rally progressives, in California and the rest of the country, to turn up the heat on this malignant administration. In March, New York City began considering an ordinance that would stop the Big Apple from doing business with companies that help build the wall. Legislators in Illinois have debated similar legislation. Pima County, Arizona, has passed a resolution condemning the wall, as has the Tucson City Council. In the little border town of Nogales, Arizona, well south of the internal Border Patrol checkpoints set up along Interstate 19, the caravan pulls in for the night at St. Andrew’s Episcopal Church, a peaceful desert oasis surrounded by low-lying mesquite trees. It is 92 degrees outside, but the interior of the church, its ceiling fans whirring, is cool. As the caravaners slowly fill the pews, they are greeted by Rodger Babnew, a construction-company owner and part-time clergyman who moved out to the borderlands from Philadelphia decades ago. Babnew is a barrel-chested man, his skin leathery and tough from years in the fierce sun. He wears black jeans and a black short-sleeve shirt.